Season cubed chicken breast pieces with 1 ½ tsp. of Slap Ya Mama Original Blend Seasoning. In a large skillet over medium-high heat, add olive oil and chicken. Cook chicken until all sides are browned. Add onions to skillet, cook until they start to soften then add bell peppers, garlic, jalapeno and sausage. Sauté for 5 minutes then add diced tomatoes, tomato sauce, chicken broth, oregano, basil, thyme and the remainder of Slap Ya Mama Original Blend Seasoning (1 ½ tsp.). Bring to a light boil, reduce heat to medium-low and let simmer for 20 minutes. With 4 minutes left to cook, stir in shrimp and parsley. Serve over a bed of penne pasta and enjoy. 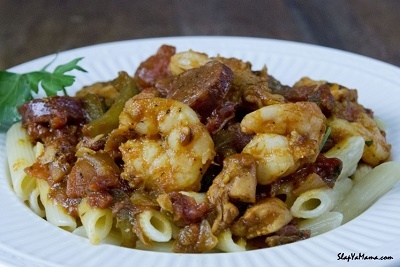 Recipe makes 6 Servings of Cajun pastalaya.